This MVC Interview question is also asked in a different way "Can we integrate FB and Twitter account authorization with our MVC Application. 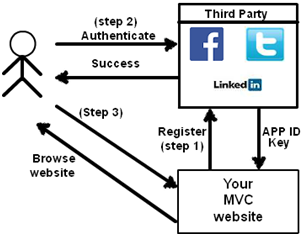 Register your MVC application / website with the external site i.e. facebook , twitter etc. Once you register your app you get an ID and key from the external site. Below is snap shot of how facebook gives the ID and Key. In FB they term the key as the "App secret". This process varies from site to site. So FB can have X steps while twitter can X+1. Next step is to open "AuthConfig.cs" and you will see lot of readymade code to user your ID and Key. 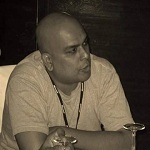 So use the appropriate method as per site and provide the ID and Key. Now if you run your application you should get a link to FB login as shown in the below screen. So if you login in FB it will redirect to your MVC application. Do not miss 100 important MVC Interview question from this codeproject article.